Every year, my husband and I take two trips. One is mainly for relaxation and the other is to explore and learn. My husband is an avid outdoors person. When he told me that his colleagues were planning a trip to Dharamshala, I knew that there would be a trek involved in this trip. And boy, was I right! He later told me that he has been wanting to trek the Indrahar Pass for a long time now and did not want to pass up this favourable opportunity. I agreed to his plan, not wanting to play spoilsport. Next thing I knew, we were on a flight from Bangalore to Dharamshala. Indrahar Pass is a mountain pass in the Dhauladhar range of the Himalayas. It stretches from an elevation of 2875 m to 4425 m and is 14160 ft above sea level. With lovely landscapes, deep gorges, placid lakes, shimmering streams and deodar forest all throughout the journey, the Indrahar Pass Trek in Himachal Pradesh is one of the most stupendous treks in the Indian Himalayan region. It is very appealing to travellers of all age groups. The journey is all about the perfect blend of vast nature and traditional colours of Himachal. The Indrahar Pass forms the border between Kangra and Chamba districts and lays bare the stretch of Dhauladhar range with the fascinating glimpse of villages. The best time to visit is from May to October. Trekking during monsoons is not a good idea. It is advised to engage the services of guides before you embark on this trek. We opted for the 4-day trek programme as we wanted to take it easy, especially since we were not used to the high altitudes. 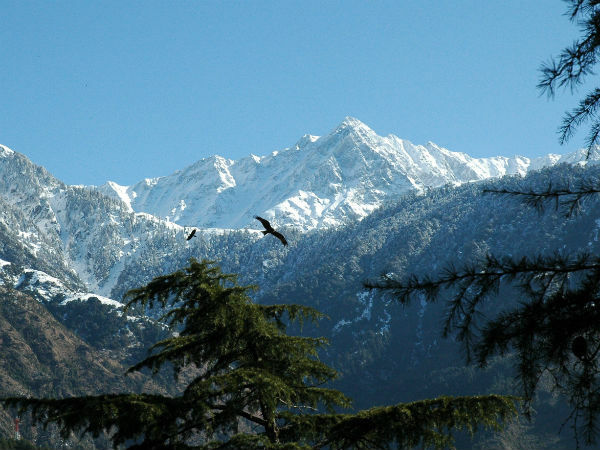 The base camp of this trip is McLeodganj, the seat of Dalai Lama. McLeodganj has some amazing food choices. I had heard from my cousin that thukpa, butter tea and momos were a definite must-have here. I was not ready to give up my plate of momos (I'd had 2 plates already) when my husband reminded me gently of the impending trek. We had taken great pains to pack for this trip as this is not like any other trek. We got windproof jackets, thermals, woollen wear, empty lightweight water bottles, sleeping bags, waterproof and snow proof trekking shoes, power bank, torch light, heavy lip guard and medicines (particularly for altitude issues). We started our trek from McLeodganj at 9 am to Triund, passing through Dharamkot, a small hamlet. This is one of the popular trekking routes in Himachal. After the Gallu Devi temple, a magnificent view of Kangra valley is seen. This is a relatively easy ascent, but it felt like a never ending one. When finally the beautiful Triund unfolded in front of us, all the fatigue vanished immediately. We reached Triund around 3 pm. We had lunch and relaxed for the night by a campfire, whilst gazing at the stars and playing antakshari. Next day, we woke up above the clouds. It was a feeling unmatched yet! We were to trek to Laka Got towards the Snowline Cafe. The first phase of this trek involved us trekking to Lahesh Caves, at a height of 3500 m above sea level. The next phase involved trekking to the Snowline Cafe and descending down to Laka Got, which is basically a grazing ground. It is advised to visit Lahesh Caves during the day as it can be risky to cross it during the night time. We finished dinner and fell asleep under the stars. Day 3 of the trek was the toughest and also the most rewarding one. We began early in the morning towards Lahesh Caves again to start our trek to Indrahar Pass. We walked over the rocks straight on the North East face of the ridge. The trail continued over the crest and we came across several ascents. The view from the pass is simply mind-blowing. To the south of the pass lay the Kangra valley, Pir Panjal to the north, Kishtwar to the west and Mani Mahesh Kailash to the northeast. We were to descend to Laka Got as the weather in this pass gets unpredictable as the day progresses. We camped at Laka Got. On Day 4, we climbed down from Laka Got, following the trails we used to ascend on days 1 and 2. After a 4 hour descent, we reached McLeodganj. The place is beautiful and keeps you riveted with its serenity. We did not want this trip to end, but alas, all good things have to come to an end. I am so happy I got to experience this once-in-a-lifetime trek.